Me? Well, I've been channeling Max Bialystock lately. When I do, I feel like him in reverse, and yet am still myself, yet becoming a new self, which is still me, but totally unlike myself, which ironically would be typical of me, except now channeling all my past selves so as to become the self I want to be, Whom I had previously tried to convince myself wasn't who I wanted to be, which is MySelf! Doctor upped my meds, & I've got an audition tomorrow. I feel like Frosties and Coco Pops all rolled into one. One big bowl of banana milk. I feel like a bear's behind. I was up 'til 4am watching dungeons & dragons, playing on singstar with my buddy and emailing weird cat pictures. Such as shame it's Sunday, because the weekend appears to have flown by and the agony of work is about to rear it's ugly head once more. Why is it so hard to find a compeletely freeware Mahjong/Taipei game that doesn't blow? I had to practically make a career out of finding one, and then I discovered Dragonboard, which, after downloading the booster packs, is pretty freakin' awesome for a freeware Taipei. The best thing is it filters out the mixtures that cannot be completed. I have just watched the "Play It Again, Brian" episode of Family Guy, featuring Martha's Vineyard and could not believe there wasn't a single Jaws reference or spoof! That was 2 days ago and I still can't get that damn song out of my head. By the way, that guy on the far left looks like Oates from Hall & Oates. I have 14 Jimi Hendrix T-Shirts and one WWJD (What Would Jimi Do) Sweatshirt. 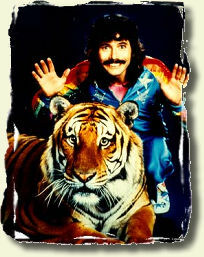 I always thought more or less he looked like Doug Henning. I had a dream last night that USA resurrected Saturday Nightmares, and they were playing a movie called The Baby. From what I could tell, this silly looking, tumer-infested baby was sucking the soul out of a woman, whom he had likewise given nasty tumors, and then choked her until something like cotton came out of her mouth. And I thought, man, this movie's awful! Must keep watching! Burger King's fry containers say "frypod" on them. I thought it was kind of witty. "And coming up next: a complete idiot did something really stupid, got injured, and now, they want to sue. Details when we come back." On my computer at work, I have hit "add to dictionary" so many times the spellchecker is completely useless. Just today I opened a document someone sent me, which had about three dozen spelling errors, and I added ALL of them to the dictionary. For some reason that makes me laugh. Why is kids TV now so rubbish. Don't say it's the age thing because it isn't, it's genuinely rubbish.